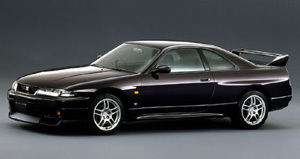 The R33 GT-R was introduced in 1995 as the successor to the legendary R32 Nissan Skyline GTR. The R33 shares most its important technical bits like the engine, all-wheel-drive, and all-wheel steering with its predecessor. It is a little larger than the R32 GT-R and weighs a little more, but mostly preserves the good traits of the older model or improves on them. With 184.1 in. (4,675 mm) of length and 53.5 in. (1,360 mm) of height, the R33 GT-R is not only longer and higher than the R32, but with 70.1 in. (1,780 mm) also wider than the latter. And it looks that - the R33 has a much wider stance, and in all looks much more impressive than its predecessor. It is rounder, too, with a design that appears more balanced and beautiful than the previous model's. The front's look remains aggressive, although less edgy than before. There are still all those scoops within the front bumper, which makes sense, since the RB26DETT wants to be cooled as before. Even though, everything looks more mature. 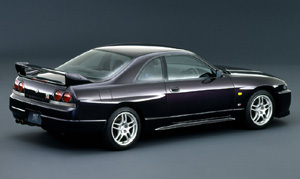 The Skyline has got rid of its end-80's-boy-racer style and looks more of a piece now than the R32 GT-R. The side and rear enhance this impression. Apart from the rear wing, additional side sills, and slightly wider wheel-housings for the 245/45 ZR17 tires, there is not much to distinguish the GT-R from the standard coupe. These applications don't disturb the design, though, but support the GT-R's sporty appearance.